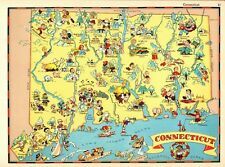 ANIMATED CONNECTICUT STATE MAP - RARE MAP REPRINT. Printed on thick, premium quality paper in beautiful rich color. 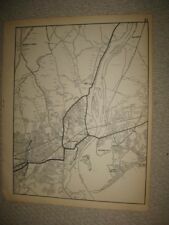 Fine, very rare, attractive, large antique 1931 map, showing Bridgeport, Trumbull and more. Printed on very thick paper, with no printing on reverse. Very finely produced period map. The size of the map is 19" by 24". ORIGINAL 1935 PICTURE MAP OF CONNECTICUT. This pictorial map features sketches of people, animals, buildings, industry, vegetation, and more. Presented is an authentic, old map taken from a dis-bound atlas published in 1934. Unusual color & size will make it a stand out on your wall. Printed on very thick paper, with no printing on reverse. Very finely produced period map. The size of the map is 19" by 24". FREE scheduling, supersized images. Fine, very rare, attractive, large antique 1931 map, showing East Bridgeport, Stratford, Nichols Farm, Rivercliff, Laurel Beach, Walnut Beach, Baldwin and more. Printed on very thick paper, with no printing on reverse. Fine, very rare, attractive, large antique 1931 map, showing bethel, Dodingtown and more. Printed on very thick paper, with no printing on reverse. Very finely produced period map. The size of the map is 19" by 24". Fine, very rare, attractive, large antique 1931 map, showing Redding, Redding Ridge, Valley Forge and more. Printed on very thick paper, with no printing on reverse. Very finely produced period map. Fine, very rare, attractive, large antique 1931 map, showing Easton, Aspetuck, Greenfield Hill, and more. Printed on very thick paper, with no printing on reverse. Very finely produced period map. The size of the map is 19" by 24". Printed on very thick paper, with no printing on reverse. Very finely produced period map. The size of the map is 16" by 20.5". FREE scheduling, supersized images. Fine, very rare, attractive, large antique 1931 lithographed map, showing Bristol, Wolcott, and more. The upper left hand side corner had seperated a bit from the map, I neatly repaired with archival tape on reverse. Fine, very rare, attractive, large antique 1931 lithographed map, showing West Suffield, East Granby and more. Printed on very thick paper, with no printing on reverse. Very finely produced period map. Fine, very rare, attractive, large antique 1931 lithographed map, showing New britain, Berlin Junction, Kensington, and more. The upper left hand side corner had seperated a bit from the map, I neatly repaired with archival tape on reverse. Fine, very rare, attractive, large antique 1931 lithographed map, showing Plainville, Southington, Plantsville, and more. The upper left hand side corner had seperated a bit from the map, I neatly repaired with archival tape on reverse. Fine, very rare, attractive, large antique 1931 map, showing Brookfield, Brookfield Center, Brookfield Junction, Hawleyville and more. Printed on very thick paper, with no printing on reverse. Very finely produced period map. Fine, very rare, attractive, large antique 1931 map, showing Ridgefield, South Salem Boutonville and more. Printed on very thick paper, with no printing on reverse. Very finely produced period map. A Gay Geography by Frank and Ruth Taylor. The photo wont show all of the fine detail and delightful caricatures, and the color is a bit off as well, the original map is printed in beautiful colors and very fine printing. PUBLISHED DATE 1932 85 years old. NOTES Map reverse is blank. Has natural middle fold as published. Reverse side has a paper fold fault that doses NOT impact map. Connecticut - Blank on reverse; Natural center fold, as published. Fine, very rare, attractive, large antique 1931 lithographed map, showing Middletown Benvenue, and more. Printed on very thick paper, with no printing on reverse. Very finely produced period map. The size of the map is 16" by 20.5". Fine, very rare, attractive, large antique 1931 lithographed map, showing Winstd, Riverton, Robertsville, and more. Printed on very thick paper, with no printing on reverse. Very finely produced period map. Fine, very rare, attractive, large antique 1931 map, showing Squantuck, Ansonia and more. Printed on very thick paper, with no printing on reverse. Very finely produced period map. The size of the map is 19" by 24". 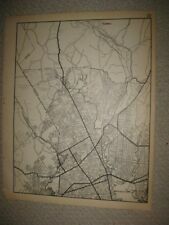 Fine, very rare, attractive, large antique 1931 lithographed map, showing West Hartford, Hartford, Bloomfield,, and more. Printed on very thick paper, with no printing on reverse. Very finely produced period map. Fine, very rare, attractive, large antique 1931 map, showing Zoar Bridge, Stevenson, Riverside, East Village and more. Printed on very thick paper, with no printing on reverse. Very finely produced period map. Fine, very rare, attractive, large antique 1931 lithographed map, showing East Windsor, Osborn, Windsorville, Rhy, South Windsor, and more. Printed on very thick paper, with no printing on reverse. Very finely produced period map. Fine, very rare, attractive, large antique 1931 lithographed map, showing Grants, Mill Brook, Colebrook Station, and more. Printed on very thick paper, with no printing on reverse. Very finely produced period map. Fine, very rare, attractive, large antique 1931 lithographed map, showing Hartland, Centerhill, Barkhamsted, and more. Printed on very thick paper, with no printing on reverse. Very finely produced period map. Fine, very rare, attractive, large antique 1931 lithographed map, showing Burrville, Nepaug, and more. Printed on very thick paper, with no printing on reverse. Very finely produced period map. The size of the map is 16" by 20.5". 1936 Rand McNally Map - NE USA - NY, PA, VA, WV, MA, VT, ME, CO, RI - 10" x 14"
Very suitable for framing, decorative display and conversation. Northeastern United States! Includes a Zerox copy of the Atlas title pages with date.